Last summer, central Ohio experienced one crazy storm that was described as an "inland hurricane." High winds knocked down trees and more trees, which pulled down power lines as they fell and caused all sorts of other damage to homes and buildings. My parents' house was hit pretty hard and is still undergoing repairs. Kudjip had a similar freak kind of a storm last week Wednesday. Although in the Southern hemisphere we actually call them "cyclones" instead of "hurricanes." At first it seemed like your normal rainy season afternoon rain. But the clouds got darker and the winds picked up. Rain started to come down strong and go horizontal. I was just getting off from work at the hospital, so I stepped into B-ward for a bit of shelter. A lot of good that did me. The ward was already flooded and the patients soaked to their bones. Hospital staff and watchman attempted to close the windows, but the rain kept on coming in anyways. Eventually the wind and rain died down enough that I could walk home. Along the way, I started to see the evidence of what an impressive storm it was. Pieces of corrugated roofing had blown off of the maintenance building. A large branch from a tree was down. OH, MY... entire trees were down. 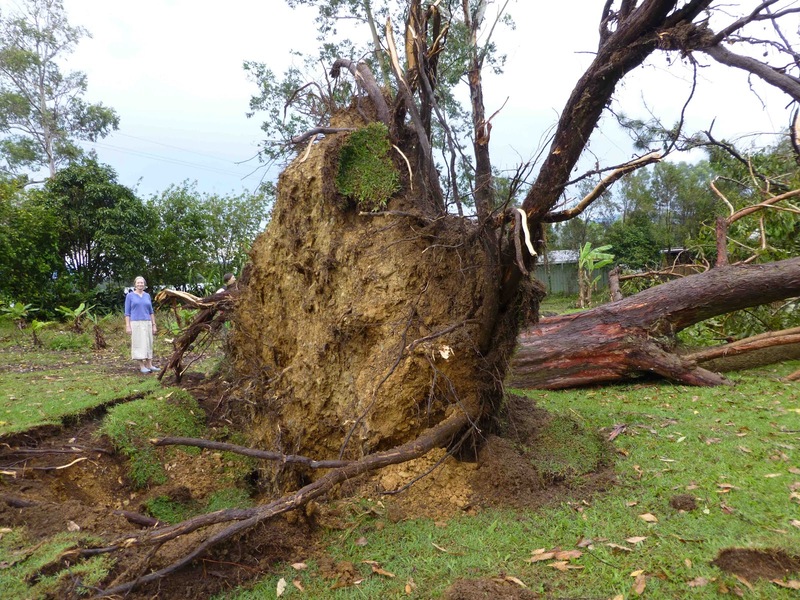 In fact, more than a dozen HUGE trees had fallen across the station taking the power lines with them. One of trees crushed a house where the Isaacs, our PNG missionaries to Vanuatu, were staying. It is a miracle that no one was injured or killed. Over the past few days, maintenance has been cleaning up the mess and putting things back together--branches picked up, trees cut, roads cleared. Power lines have been re-attached, and electricity lights up the station once again. 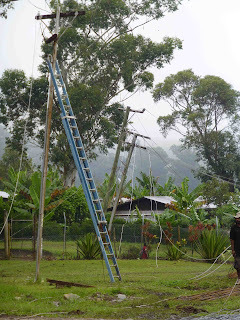 Our end was just about the last bit to have the power restored--we went without for about 52 hours. Thank the Lord for Jordan and Noli and the awesome team of maintenance guys! 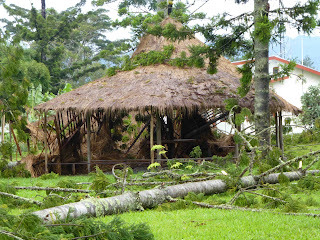 Here is a link to Dr. Erin's blog and pictures of the Kudjip storm. "When the storm has swept by, the wicked are gone, but the righteous stand firm forever."